That low rumbling roar you hear outside is not distant thunder. It is the great wailing and gnashing of teeth of liberal weenies from sea to shining sea. Two years of certainty that Bob Mueller had the goods on President Trump, with the mainstream media hyping 24/7 that the next sliver of non-evidence is the smoking gun that takes down the president, with bizarre-looking creatures Max Wig (Maxine Waters) and Adam Schifferbrains who look as though they just stepped out of the Star Wars bar scene, declaring that they had the evidence and Trump’s time in office was short, it is easy to see how crushing the blow to liberal weenies in light of Mueller’s “no collusion” conclusion. So, there they go, wandering about like so many zombies, staring blankly into space, drivers slamming the brakes to avoid hitting them. The mindless progressive zombies have nothing left, only each other, and God knows that ain’t much. 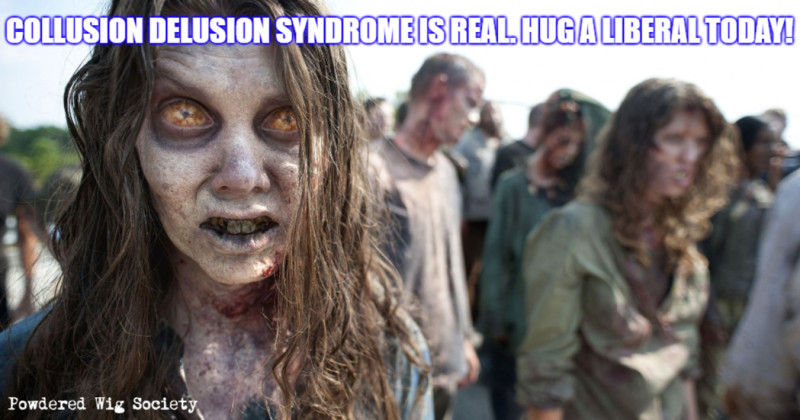 It’s Collusion Delusion Syndrome (CDS), the newest liberal disorder which afflicts tens of millions of whiny Trump-haters, a predictable and natural progression of the devastating Trump Delusion Syndrome (TDS), first diagnosed in 2016. Brent Bozell of Media Research Center, compassionate conservative that he is, has organized an army of volunteers who are seeking out liberal weenies afflicted with CDS in an effort to alleviate their suffering. As CDS appears to be more prevalent in blue states and urban areas, Bozell’s Brigade is concentrating its efforts in such pitifully progressive locales as Berkeley and Boston, New York and Hollywood, distributing free CDS survival kits. From coast to coast, Bozell’s missionaries seek out the afflicted, offering them free facial tissue, teddy bears, stress relief tea, antacid and ibuprofen pain relief tablets, coloring books and crayons, and even two airline bottles of Russian vodka, all in an attractive Media Research Center tote bag which, when applied over the head of the afflicted, becomes a clever makeshift safe space. Conspicuously absent from the CDS survival kit is a pacifier. This is not an oversight, but rather a testament to the generosity of Bozell’s benevolent benefactors who selflessly offer to breastfeed on the spot liberal weenies so desperately in need of comfort. CDS is real and it is tragic. Do your part. Hug a liberal today. Do your part. Hug a liberal today. It is the right thing to do. Yes! I have been saying for over a year that the concerted effort by the left and MSM to remove a sitting president is nothing short of seditious conspiracy, and all of them should be tried, convicted, and sent to the joint for it. Not long ago that was SOP.